Do you know how to bring out the colour of your eyes? Certain eyeshadow shades complement certain eye colours, and it can be quite surprising! 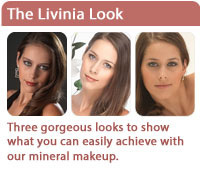 Here are some recommendations using Livinia mineral eyeshadows. Click on the colour circle to view larger.